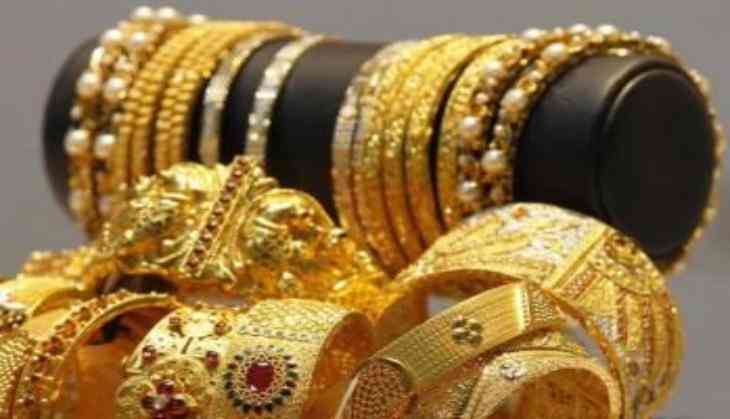 Gold prices fell by Rs 250 to trade at Rs 31,200 per 10 grams at the bullion market today due to a slowdown in buying by local jewellers even as the rates of the precious metal strengthened overseas. Silver too cracked below the Rs 41,000-mark by falling Rs 350 to Rs 40,650 per kg due to reduced offtake by industrial units. Bullion traders said fall in demand from local jewellers and retailers at existing levels at the domestic spot market mainly pulled down gold prices but a firm trend overseas capped the fall. Globally, gold rose 0.15 per cent to USD 1,349.30 an ounce and silver by 0.72 per cent to USD 17.38 an ounce in New York yesterday. In the national capital, gold of 99.9 per cent and 99.5 per cent purity plunged by Rs 250 each to Rs 31,200 and Rs 31,050 per 10 gram, respectively. Sovereign, however, remained flat at Rs 24,800 per piece of eight gram. In step with gold, silver ready fell by Rs 350 to Rs 40,650 per kg and weekly-based delivery by Rs 170 to Rs 39,960 per kg. Silver coins, however, spurted by Rs 1,000 to Rs 75,000 for buying and Rs 76,000 for selling of 100 pieces.